Justin Bieber turned the big 2-1 on Sunday, March 1, and he celebrated with lots of lovely ladies around him. According to TMZ, Justin feted his 21st birthday ‘popping champagne on a private island’ near Grenada on Saturday, Feb. 28. 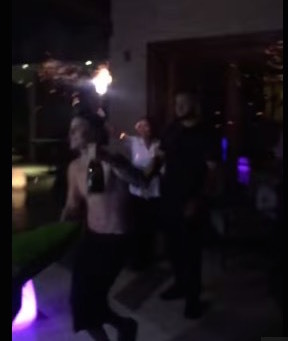 A video posted to Twitter shows him dancing shirtless to 50 Cent’s “In Da Club,” as fellow partygoers wave sparklers in the air around him. One of those partygoers was pal Hailey Baldwin. She shared a photo from the bash via Instagram, of herself hugging JB from behind as he stares dazedly into the camera. The two have been spotted hanging out in recent months, but both deny they’re more than friends. Rumored former hookup Yovanna Ventura also posted a picture from the party on Saturday. In the shot, she halfway straddles JB, one leg around his waist, as he pulls her close and grabs the underside of her thigh. “Happy birthday! !” she captioned the photo. love you, belieber for life. Nothing wrong with having a few drinks and a good time on your 21st birthday, I hope though that it doesn’t lead Justin back to his wild partying ways as that would be a shame as he was doing so good keeping away from that scene and that crowd.